On the left you see me shlepping a car seat along the path at Hardy Falls, carrying two-month-old Ezra like the lump he was. 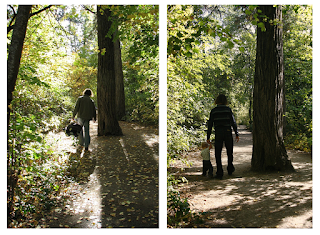 The picture on the right is the two of us walking along the path together on Saturday, almost a year later. The transformation humans go through in their first year of life is just unbelievable. A miracle, really. I still carry him sometimes, but that lump of a year ago is now a walking, self-feeding, communicating, cup-sipping, giggling, raspberry-poaching, ball-throwing, power-tripping kid. That's cool. I love time lapse photos. Love how Ezra ran away then ran back to show us his ball the other day, SO cute! Me too, I love time lapse photos. The lighting is nearly identical! Yeah, they are really similar, aren't they? Just a bit different time of day (morning a year ago and afternoon this weekend)...and a walking kid instead of a lump! They're neat shots. I should have properly credited Tannis for taking both!